A very odd New Year’s Day – it RAINED – ­pouring rain, thunder and lightning. And then, of course, it all froze into a glaze of ice on everything. All the trees and bushes and the driveway, and every single blade of grass had a coating of ice. It was very difficult to walk on the driveway ­ and much too hard to plant seeds. I did take a few careful walks ­- walking through the fields wasn’t too bad. The ice coating on the grasses crunched as I walked, but it wasn’t slippery. I walked up the dugway to Big View Prairie, and got a wonderful view of the valley. I decided to come down through the woods, since the dugway was a bit slippery and would be even worse on the way down. The woods wasn’t too bad when I could walk on the leaves, but the deer paths were like streams of ice. A couple of times I just had to sit down and slide. All the mosses and branches and logs in the woods had coatings of ice too. 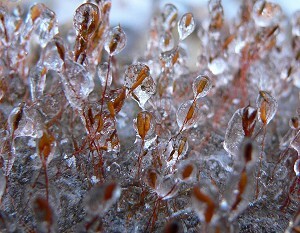 These are moss sporangia encased in ice. I also walked over to the big spring in front of Pine Point. 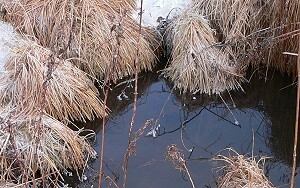 The water was still open and all the surrounding sedges were frosted. I could see tiny creatures swimming in the water – maybe some kind of insects – the water can’t be much more than 32 degrees. 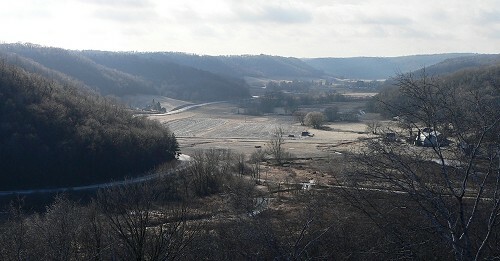 Just east of the spring is an odd place where water has welled up and frozen. 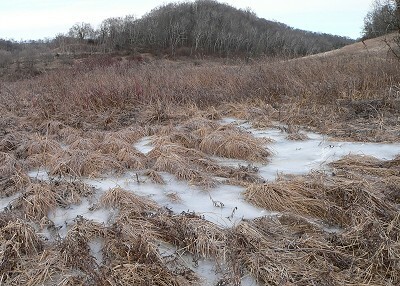 It will be interesting to see what this looks like in the spring. Last year it was wet but didn’t have any standing water.